Can I Run My Car On Bio Diesel? Bio-diesel can be made from numerous different sources: canola, soy, peanuts, algae, palm, hemp, sunflower, and animal fats. It is typically made by chemically reacting fats (lipids) with an alcohol (usually methanol) in a process called transesterification. You can read more on this process here, it is interesting stuff. 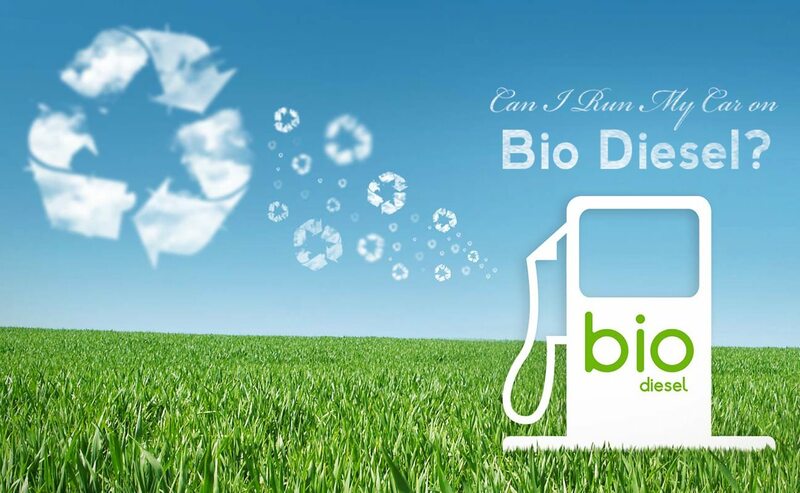 What are the benefits of using Bio Diesel? Bio-diesel significantly lowers the emissions of your vehicle with little to no noticeable loss in power or fuel economy. The reduction in emissions is staggering, actually, and we will provide a full chart below this article. On top of the cleaner burn, it is also locally sourced, which reduces our dependence on foreign oil. It is less toxic than fossil fuels, so it is safer to handle, and when made from used oils and fats it helps to ensure proper recycling of former waste products. Can I run bio-diesel in my vehicle? Bio-diesel is intended to be used in standard diesel engines (cars, boats, trucks, tractors) and is thus different than regular vegetable oil and waste vegetable oil (WVO). It can be used alone or blended with petro-diesel in any proportion. It can also be used as an alternative to home heating oil. If your car was made after 1993 it will require no modification of any kind to run bio-diesel. If your car was made prior to 1993, the rubber fuel lines will probably have to be replaced. One of the major advantages of using biodiesel is the fact that it can be used in existing diesel engines without negative impacts to operating performance. Bio-diesel is the only alternative fuel for heavyweight vehicles that does not require any special injection or storage modifications. One thing to note is that bio diesel is a solvent. It will clear out many diesel deposits that have accumulated in your fuel tank. This may cause initial fuel filter clogging but continued use of bio-diesel will not cause an increased frequency of filter changes. The diesel engine as originally designed by Rudolf Diesel was meant to run on peanut oil. It can be made from virgin vegetable oil or used vegetable oil, called “waste vegetable oil” (WVO). You can source bio-diesel from a variety of organizations in Victoria. You can join the Biodiesel Co-op or you can connect with the BC Biofuel Network. There are a growing number of options available, each with their own merits. Call around and decide who is a good fit for your needs.